Any questions? We’re glad to help you! Contact us via e-mail or call us: we speak English. Careful and elaborate renovation has, over the years, turned this rural 19th century estate above the town of Pioppi into a picture-postcard holiday home. Casale Le Lesche’s fantastic location in the midst of the Cilento’s green hilly landscape and the marvelous view of the sea are fascinating. 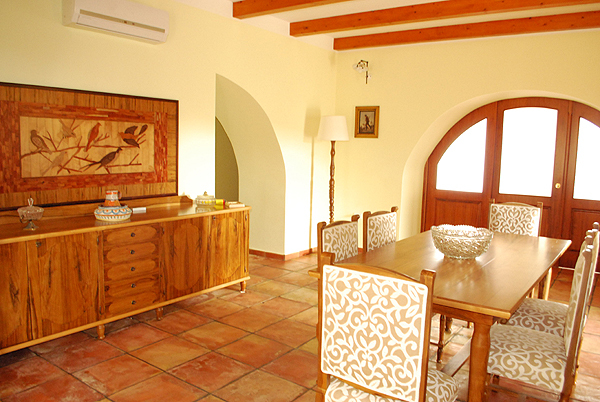 The friendly and considerate owning family has done their utmost to create an oasis of well-being for their guests. 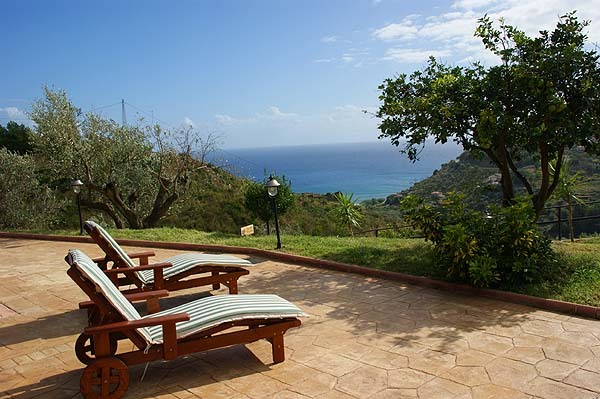 You are welcome to take long walks or strolls on the 3,000 m² premises and enjoy the fragrance of the Mediterranean vegetation and the view of the cobalt blue sea. 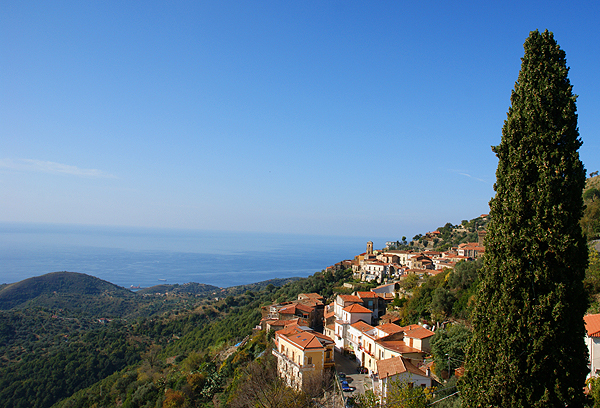 The idyllic town of Pioppi, famous due to the „Dieta Mediterranea“ and awarded the „Bandiera Blu“ for best water quality, with its shops, restaurants and bars as well as the beach is only 1 km off. 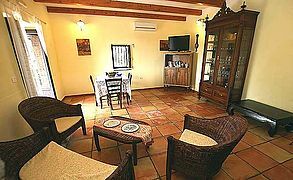 Upon entering Casale Le Lesche, you find yourself in the spacious living/dining room, which is furnished with several seating accommodations, SAT-TV, air conditioning with heating system. There is also a separate WC on this floor. The adjoining eat-in kitchen, which is equipped with 4-burner gas stove, oven, refrigerator with freezer compartment and dining furniture, opens onto the terrace. You can enjoy delicacies of the "Dieta Mediterranea", that is to say of the Mediterranean cuisine, either in the large dining room or, weather permitting, on the spacious sea view terrace. 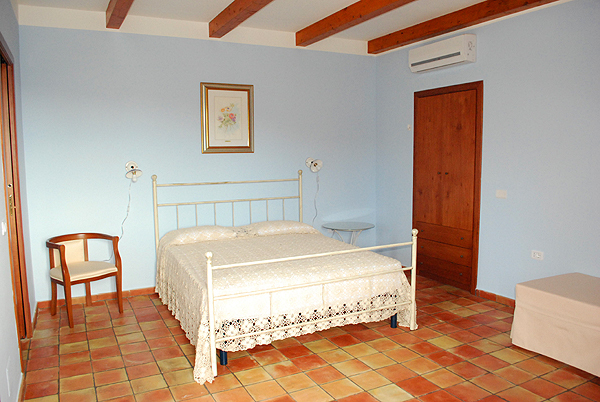 Bedrooms – each with en suite bathroom! 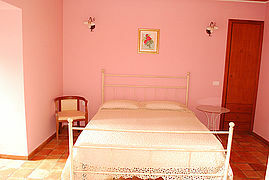 Rosa: double bed, bathroom with shower, WC/bidet, chair bed, fly screen, SAT-TV, air conditioning with integrated heating system. Azzurra: double bed, bathroom with shower, WC/bidet, chair bed, fly screen, lateral sea view, SAT-TV, air conditioning with integrated heating system. 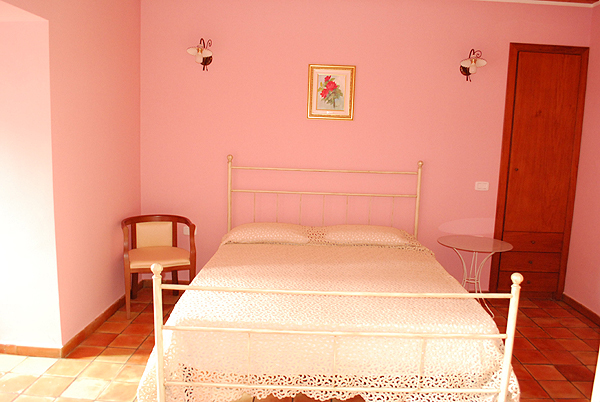 Single: single bed, bathroom with shower, WC/bidet, fly screen, lateral sea view, SAT-TV. 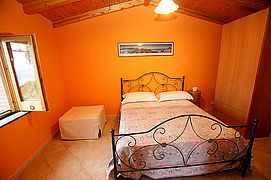 The two bedrooms on the attic floor are twins and each has an en suite bathroom with shower, WC and bidet. The spacious terrace offers what your heart desires: several sunbeds for sun worshippers and seating accommodations in the shade under a pergola. 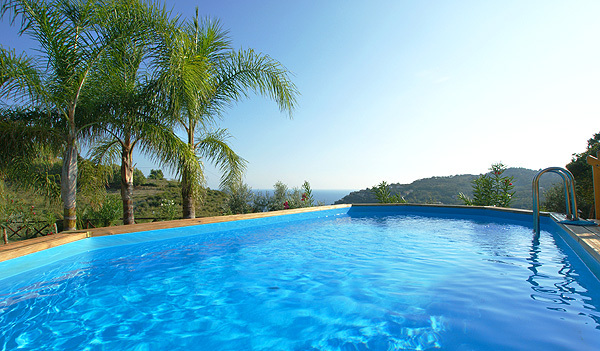 Enjoy cooling off in the pool next to the terrace and the unobstructed view of the sea. For an in-between snack, simply pick a pomegranate from the tree. 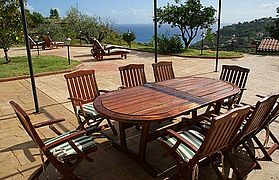 It is great to spend as much time out in the open as possible during your holidays, so you might also do your cooking out-of-doors; behind the house, there is an outdoor kitchen with masonry grill, gas cooker, dishes, sink, table and chairs. 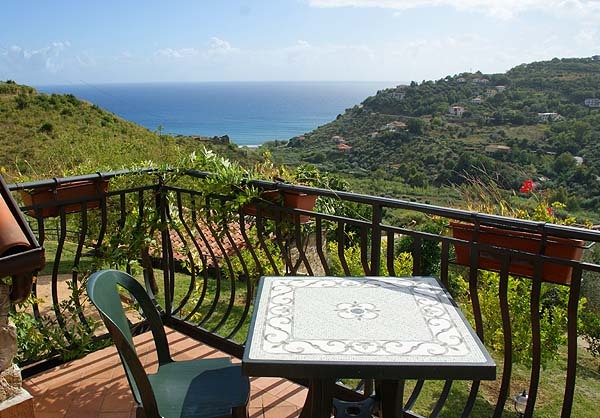 30 m below Casale Le Lesche, a separate guest house with sea view terrace, eat-in kitchen, double bedroom with sea view window and bathroom (shower, WC, bidet) accommodates another 2 persons. 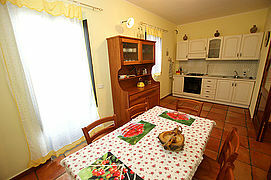 Furnishing of Casale Le Lesche also includes WiFi and washing machine. Parking is available on the premises, in front of the house. Shops, restaurants and bars as well as a seaside promenade lined with palm trees are found at Pioppi about one kilometer off, the sea is about 900 meters off. There is a public tennis court below the house, about 650 m off. 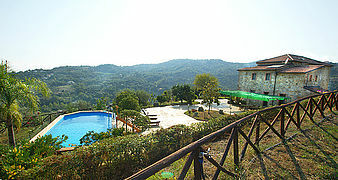 Pioppi is an ideal starting point for hiking tours, e.g. 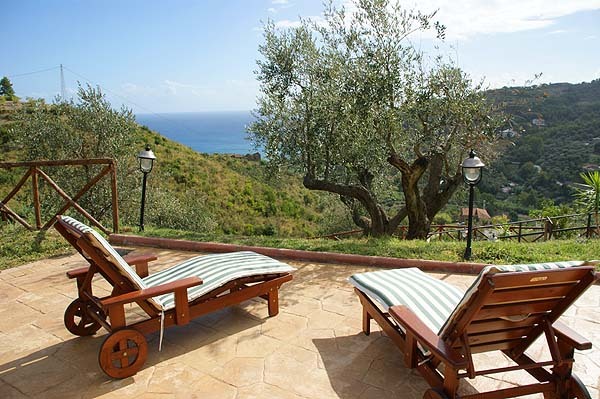 to Pollica, one of the nicest places in the western part of the Cilento. 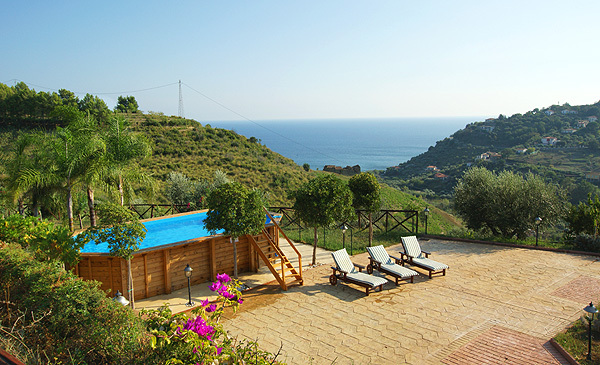 Following the valley of Mortelle, passing kitchen gardens, vineyards and fruit groves, you delight in a breathtaking panoramic view of the Gulf of Ascea, the ancient ruins of Vélia and Capo Palinuro. 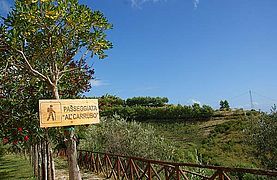 You pass olive groves and cross fragrant macchia, when finally descending to Acciaroli, from where you can take one of the busses back to Pioppi. It is only a few kilometers from Pioppi to the old Greek town of Velia, today’s Ascea. 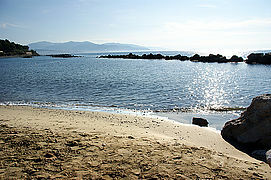 The town is known for its excavations of the Greek town of Elea (today: Velia), which dates back to the 6th century BC. 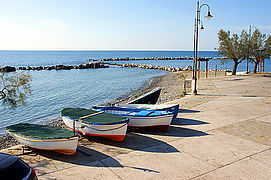 Nearest train stations: Marina di Ascea (ca. 11 km) and Vallo Scalo (ca. 14 km). The exact address and the information about the details of your journey are included in the booking confirmation. 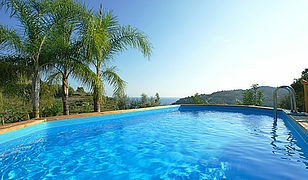 Terrace and pool with unobstructed sea view. 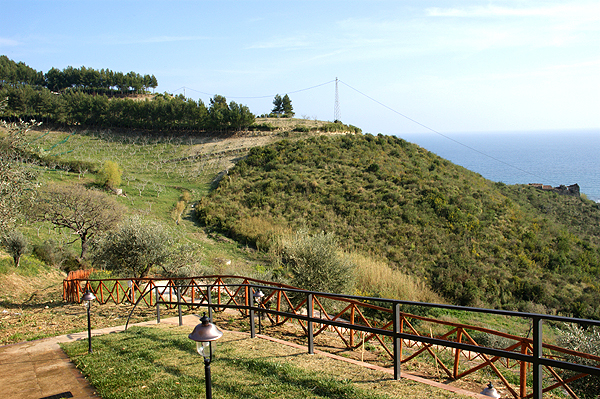 View of the landscape and the sea from the balcony of Casale Le Lesche. 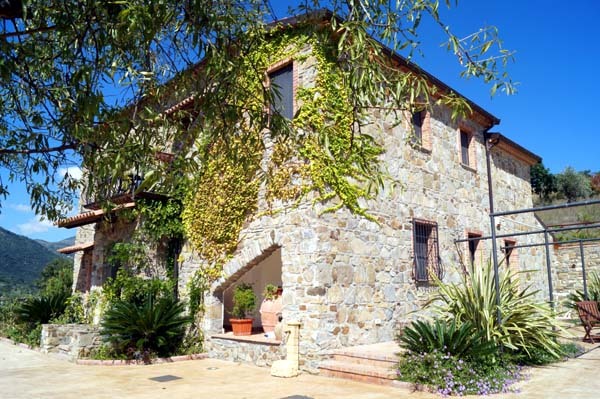 Ideal for long walks – the rambling premises of Casale Le Lesche. The Casale's dining area on the ground floor. 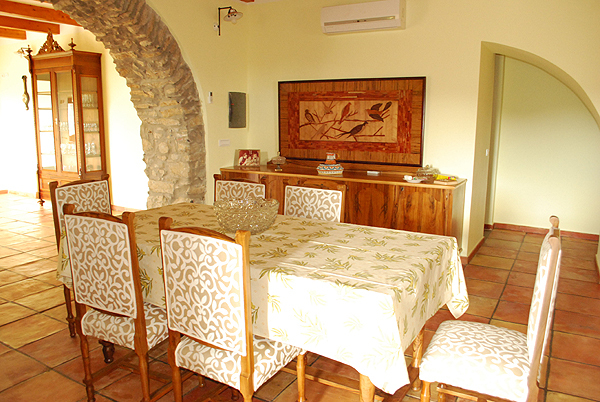 Glance into the living room of Casale Le Lesche. The eat-in kitchen opens onto the terrace. 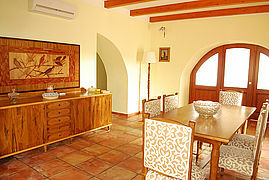 The spacious terrace with solid wooden furniture. 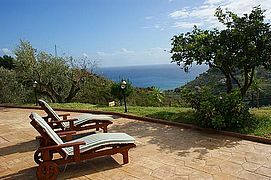 On the terrace you find a lot of sunbeds to relax on. 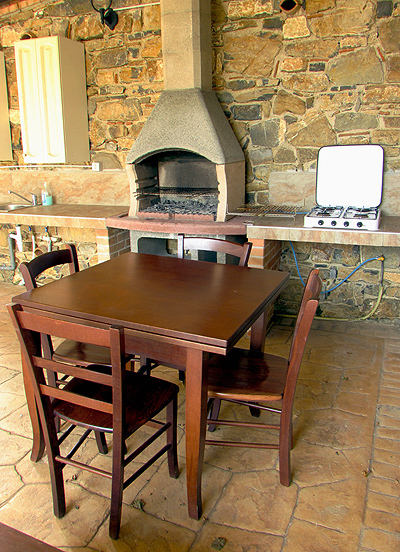 Roofed outdoor kitchen: grill, gas stove, sink. 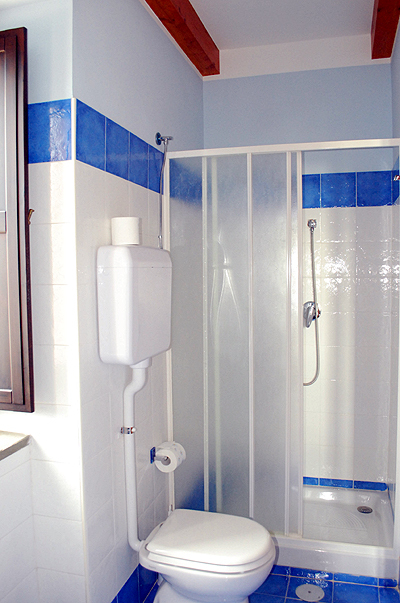 The bathroom of room Azzurra. The dependance with its lovely quarry stone façade. The double room with sea view window at the Dependance. Walking and strolling around the premises, for example along passeggiata al carrubo (carob tree trail). Distinguished for best water quality: the beach of Pioppi. 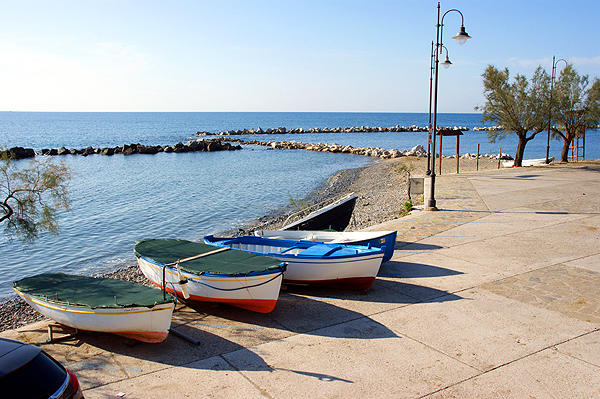 Enjoy wonderful walks along the long seaside promenade of Pioppi. One of Pollica's characteristic features: medieval alleys criss-crossing the town. Was hat uns besonders gut gefallen? Sowohl die Region als auch die Unterkunft waren top: Die Region zeichnet sich durch eine wunderbare Landschaft mit sanften grünbewaldeten Hügeln, Bergen und Stränden aus. Auch das Wetter war im Oktober noch schön. Das gesamte Ferienhaus war toll und geschmackvoll renoviert. Das Haus hat eine optimale Lage und - was uns besonders zugesagt hat - jedes Schlafzimmer des Hauses hat ein eigenes Bad. Wir kommen wieder, weil uns der Cilento so gut gefallen hat und wir gerne noch mehr davon sehen möchten! Wir sind schon seit Jahrzehnten immer wieder im Cilento und lieben die Landschaft und die Strände! Das schöne Haus hat eine super Lage! 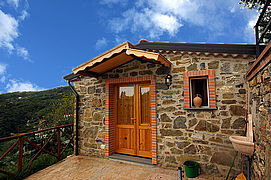 Ein sehr schönes und sauberes Ferienhaus! Besonders die äußerst gute Ausstattung muss gesondert erwähnt werden: es sind ausreichend Gläser (Wasser-, Wein- und Likörgläser), Geschirr und Besteck für zwölf Personen vorhanden! Die Außenanlage des Ferienhauses ist wunderschön, bietet einen herrlichen Ausblick und viel Ruhe! Zudem sind ausreichend Liegestühle vorhanden. Die Eigentümer sind zudem sehr nett und wir haben uns mit ihnen in Französisch unterhalten! Ein sehr schönes Ferienhaus in perfekter Lage! Der Vermieter war auch stets sehr nett und hilfsbereit! Wir verbringen gerne einen weiteren Urlaub hier! 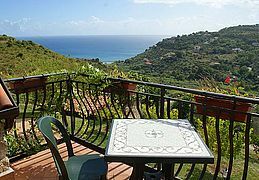 Das Ferienhaus liegt einfach traumhaft und hat eine tolle riesige Terrasse mit phantastischem Ausblick! Den Cilento kennen wir seit über 30 Jahren und es gefällt uns immer noch super: abwechslungsreiche Landschaft, Nähe zu Kulturstätten wie Paestum oder Pompeij und schönes Wetter sowie gutes Essen garantiert! Bis zum nächsten Mal! 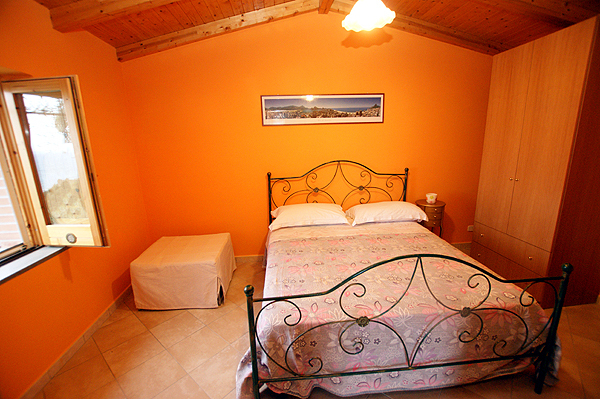 Prices are valid per week for the number of persons given in brackets and include bed linen, towels, final cleaning and air conditioning. A deposit of 150 Euro is due upon arrival. Pool open: May – October (changes due to weather conditions possible). © Cilentano - The Real Southern Italy!